Are you sending a monthly chiropractic newsletter? If you are, you know just how valuable they are for patient retention and engagement. Sure, you’re busy. Adding a newsletter to your task list may seem like a colossal assignment. But it’s more than just a “task.” Publishing a monthly newsletter offers two critical benefits for your practice: improved patient retention and new patient growth. Monthly newsletters are an excellent, pressure-free approach to nurturing ongoing relationships with your patients. It’s a way to keep your practice top of mind. This produces loyal patients who are engaged with you, active in their chiropractic health, and willing to refer you to their friends. If you don’t use a website service like Perfect Patients that drafts and sends newsletters for you, creating newsletters can be time consuming. But they are doable. It’s important to follow a strategic blueprint, though; otherwise, it could be a waste of your time. The first step to creating a successful practice newsletter is ensuring that your emails are getting opened. Your newsletter may be competing with dozens of other emails in a patient’s inbox. Any old subject line won’t do. You want something that is compelling and encourages people to click. Attention spans are short. That’s why bite-sized articles are the way to go. By offering brief, interesting articles you’ll keep your readers engaged and prevent them from clicking to the next email. Your newsletter needs be readable. This means being mindful of word choice, sentence length, and overall formatting. Data indicates that most adults read at a 7th – 8th grade reading level. Keep this in mind as you write for your patients. With so many emails to sift through, patients are choosy in what they are and are not willing to read. Compelling photos will bring your newsletters to life. They grab the reader’s attention, preventing them from quickly clicking the “delete” button. There are a number of websites (pixabay.com, for instance) that offer free images for you to use in your newsletters. You can also use quality stock photos from sites like thinkstockphotos.com. Note: Be aware of copyrighted material. Many people believe that any photo they find on the Internet is a “free stock photo.” But harvesting a photo from some other website could end up costing you over $1,000 or more! Here are a few safe ways to use photos for your chiropractic newsletter: create your own original photo, use a free stock photo (investigate to determine whether it is, in fact, free), or sign up for a paid stock photo site. Directing readers to your website – by linking to blog articles in the newsletter – drives qualified traffic to your website where patients can find even more valuable content. The idea isn’t for them to read your newsletter and stop there. You want to tease them enough to get them active on your site. This traffic promotes repeat appointments and signals to the search engines that your website is one of authority. To reach those beyond your existing patient base, be sure that your newsletter is shareable. This means sharing it on social media and making it easy for patients to pass along to their friends and followers. You may also want to send your newsletter via snail mail. This ensures that you’re reaching patients whom you don’t have an email address for. Your newsletters should be an ongoing chiropractic marketing strategy. If you want to encourage consistent appointments, you’ll have to consistently promote your practice. A monthly strategy will deliver optimal results. Among the top goals of your chiropractic newsletter are to encourage repeat appointments and stimulate referrals. To do so, you’ll need to take the time to write and market your newsletter month after month. If you don’t have the time yourself, employ a trusted staff member or consider a chiropractic marketing company that can manage your newsletter for you. 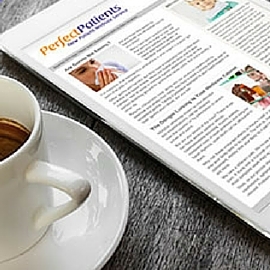 Are you wondering if a patient newsletter is right for your practice? See how newsletters rank among the most popular features that Perfect Patients’ website service has to offer. « Synergy Chiropractic Launches New Chiropractic Website!